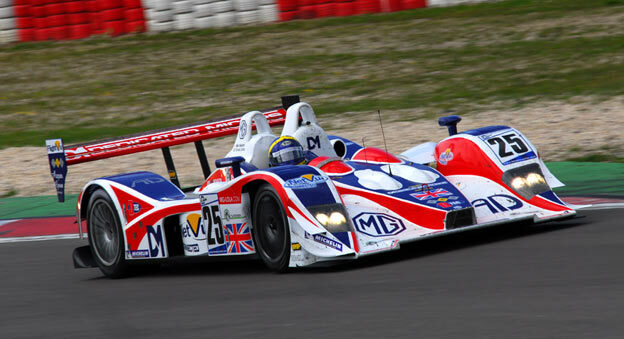 The RML driver pairing of Mike Newton and Thomas Erdos secured a memorable LMP2 victory in the Nurburgring 1000 kilometres today for Round 3 of the 2007 Le Mans Series. In a race where few cars encountered the usual problems, it was an especially sweet win for the Wellingborough-based team. The knowledge that they had beaten tough opposition on pace alone came as rich reward after the disappointment of missing out on a hat-trick of class wins in the Le Mans 24 Hours just a fortnight ago. That sensation also came as some recompense for the many occasions over the past two seasons when near-certain victory has been snatched away at the last moment by a bizarre failure or unforeseen mishap. This time, against one of the toughest grids yet amassed for the Le Mans Series, the RML AD Group MG EX264 swept through from start to finish in a supreme demonstration of pitlane efficiency and unbeatable pace. Following on from claiming pole on Saturday, Thomas Erdos drove a faultless first double-stint. The red, white and blue MG lead the LMP2 class all the way, save for a three-lap break created by an early pitstop for fuel, and he handed over at the end of two hours with a lead of over a minute from the second-placed Quifel ASM Lola. Mike Newton, who had already demonstrated a considerable improvement in speed during free practice, maintained that level of pace for the next third of the race. Lapping consistently and without drama, he was able to hand back the MG for the final two hours with the advantage comfortably intact. It then rested with Thomas Erdos to steer the car home; a feat he achieved with considerable finesse, not only extending the lead, but setting a new race lap record along the way of 1:49.031. The next round is at Spa-Francorchamps in Belgium on August 19th. After the rush of the last ten days, since Le Mans, the next few weeks will come as a welcome break for the team. High resolution images from Nurburgring may be viewed and downloaded from the Nurburgring gallery.